From homophobia to Islamophobia to cultism, she is no progressive's dream. To some progressives, the news Monday that Tulsi Gabbard was meeting with President-Elect Donald Trump for consideration of a position in his administration must have been confusing. 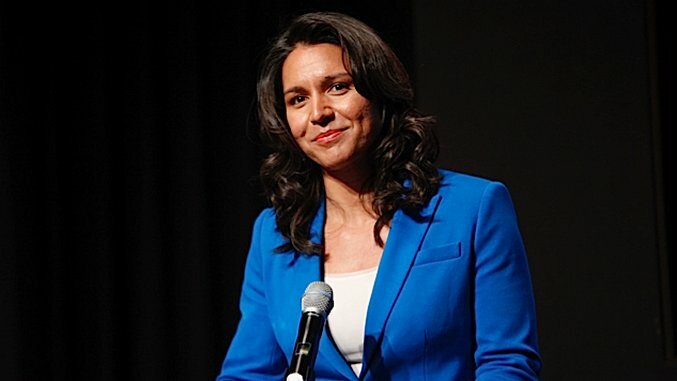 Gabbard’s February 2016 endorsement of Bernie Sanders’ quixotic run for the Democratic nomination for president involved publicly resigning her seat as DNC Vice Chair. Her name has been floated as a possible candidate for 2020. And at a glance, her positions seem in line with the liberal wing of her party. But a deeper look at Gabbard’s political career shows that she is devoted to attaining power and to the perpetuation of extremist, fringe ideology. She adopts and sheds extremist positions at will, but one thing remains constant: her consistent embrace of hard-right politics. The 35-year-old Congresswoman from Hawaii was raised in a politically powerful household. Her father, Mike Gabbard, is a well-known firebrand in Hawaiian politics— his most beloved issue is a virulent rejection of homosexuality and gay rights. The younger Gabbard protested against a bill advocating civil unions during her tenure in the Hawaii Congress, holding up signs decrying the proposition. The bill eventually stalled. Gabbard replied to a request for comment on her father’s connections with cult leader Chris Butler (more below) in 2004 with an oddly worded email accusing Honolulu Magazine of a homosexual conspiratorial attempt to discredit her father. This political position held until 2012, when she made an about face and declared she supported gay rights— just in time for the election for Hawaii’s 2nd District. And that wasn’t the first time she had shed a piece of her past in order to make herself more palatable to voters. Gabbard’s first marriage, to a man named Eduardo Tamayo, lasted from 2002 to 2006. Tamayo and Gabbard were both involved with a man named Chris Butler, the leader of a Hare Krishna spinoff called the Science of Identity Foundation that is located in Honolulu County. The Hawaii Free Press notes that a number of Butler-connected Hawaiians have contributed to Gabbard and that her involvement with the cult is still an open question. Gabbard has scrubbed all mention of her past with Butler’s cult, and with Tamayo, from the internet. The only evidence that is publicly available that Tamayo and Gabbard even know each other— excepting her Wikipedia page— is from anti-cult site Flashlight on Roaches. It’s grainy, but it does show the two together. It’s also the only known photo of Tamayo that is publicly available. The Gabbard family’s ties to Butler still hound her — in the hallways of the Hawaii State Capitol, on blogs of political observers, on pages of online discussion forums, and in commentary sections of various news sites, including Civil Beat’s. By now, Gabbard has left any ambiguity about her religious beliefs behind. She identifies as a member of the Gaudiya Vaishnavism Sect of the Hindu faith. It’s a faith she shares with India’s leader, Narendra Modi. But they share more than that— they share a hard-right political philosophy that is at odds with Gabbard’s perceived role as a liberal touchstone in the Democratic Party. Modi, a member of the Bharatiya Janata Party, or BJP, is well known in India for his hardline right wing politics. He was the governor of the state of Gujarat during riots in 2002 that killed over 2,000 Muslims. Modi has always skirted around his level of responsibility for the violence; on the one hand he can appeal to moderates by claiming ignorance, on the other his claims of ignorance are delivered with winks to the country’s more extremist right-wing elements. Modi relies on Rashtriya Swayamsevak Sangh, or RSS, for political backing. The BJP and RSS’s actions have been repressive and violent and involve a complete distortion of historical and material reality in order to maintain their control of the state. The RSS-BJP alliance also uses the fears and prejudices of the majority Hindu Indian population against Muslims to ensure its hold on power. And those views are views that Gabbard shares with them— despite her framing of herself as a peaceful warrior. A major part of Gabbard’s political story is her military service. Gabbard joined the Hawaiian National Guard in 2002 and served in Iraq in 2004. Since returning to the US, she has advocated for a less muscular and antagonistic US role in the world. As far as it goes, this is fine— she opposes US intervention in the Middle East, generally, and argues against the use of drone strikes and the NSA’s surveillance programs. Gabbard’s relationship with Modi is well documented in Indian publications. Her admiration of the authoritarian leader is the subject of multiple interviews, where she consistently affirms her support of the Prime Minister and his hardline party. In a three-week visit to India on the invitation of Modi himself, she was treated as a state guest and held private meetings with the Prime Minister and members of his party. And Gabbard has protected Modi’s interests in the US. She fought against a November, 2015, Congressional bill mentioning his role in the Gujarat massacres, decried the US’s refusal to issue a visa for the controversial leader before 2014, and supported efforts to rewrite Indian history from a Hindu-supremacist viewpoint in US textbooks. She has worked to relax restrictions on Indian immigration to the US even as she joins with Trump’s rhetoric in attempts to refuse allowing Syrian refugees into the country. And her views on Islam mirror those of Modi’s— both insist that identifying the faith of Islamists is of paramount importance in fighting extremism (not of Hindu extremism, of course). Gabbard quickly flipped on Donald Trump. When Trump appointed white nationalist Stephen Bannon as his Senior Strategist two weeks ago and 169 Congressional Democrats opposed the move, Gabbard’s name was notably missing. Perhaps it’s because Gabbard is, once again, jettisoning political beliefs that are no longer useful in her quest for power. It could be that Sanders and the Democrats are no longer helpful to her career, like her father’s homophobia and her public cult-connected marriage. So they must go so Gabbard can continue her rise. That’s a likely scenario. But it only works if you remember that the other constant in Gabbard’s career is an attraction to hard-right political positions. Even those positions she eventually leaves behind are replaced with more extreme positions—her anti-gay activism replaced with Islamophobia, her ties to a Hawai?i-based cult replaced with ties to Hindu extremism. News media have reported that Gabbard is under consideration for a position with the Trump administration, that her meeting with the president-elect was more than a bipartisan discussion—it was a job interview. Given what we know about Gabbard’s attraction to the extreme right and her thirst for power, a place in the Trump administration won’t come as a surprise. It’s par for the course. Update: Read Gabbard’s rationale for her meeting with Trump here.